As per franchise support company ‘Franchise Help,’ there were around 165000 firms working in the management field and residential brokerage in 2014. Various reports also suggest that this industry generates billion dollars of revenue each year. This ever growing industry needs support of external elements to remain in growth state forever. Contact center service is one such domain which has high potential for supporting the real estate industry with an array of services. Hiring an external agency to handle calls is more feasible for real estate companies as the agents along with management staff are more proficient than the employees of the real estate companies. Also, the process is more economically feasible when compared to in-house call center process. 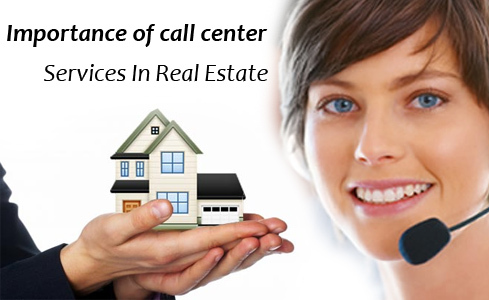 Customer support and telemarketing are two major aspects of contact center services which are vital for real estate. Let’s look at each dimension separately in detail. If used wisely, telemarketing services by call centers can provide amazing profits by raising the number of prospected clients. In this scenario, a telemarketer gives a call to prospected clients to inform about a new property which is available in the neighborhood for a sale. The purpose is to invite the prospected clients for previewing that property. This increases the chances of the property being purchased by that prospected customers. Whenever a seller puts an advertisement related to selling his property on internet, the telemarketers can give a call to check the status of the property. The main aim is to recommend the seller to put the property in the database of the realtor or real estate agency to improve its chances of getting sold quickly. In case the seller is not interested, then a reminder call can also be done after 8-10 days to check the status again. These reminder calls often prove fruitful as various sellers get ready to take support of realtors on the subsequent calls. Telemarketers can give a call to a property owner to ask if they are interested in evaluating the market value of their property. This helps the real estate firms and realtors to keep the property owners in loop. These property owners can ultimately turn into clients if they plan to sell their property in future. In this case, the telemarketers give a call to sellers who have listed their property for sale. They ask the sellers about their requirements for new property in same or different location. This scenario helps turning these sellers into leads if they are interested in purchasing the property. Calls can be made by telemarketers to previous customers for discussing the opportunities related to investment in real estate sector. There is more possibility of existing customers to invest in the property by taking support of same real estate company. Customer support is another important aspect of call center support which is essential to instill trust for the company among potential and existing customers. Here are some operations that customer support agents can handle on behalf of real estate companies. Whenever prospected customers call the real estate company, they expect the process of scheduling to be performed smoothly. A proficient agent from a renowned customer support agency ensures that scheduling for the property visit is done efficiently for the customers. Customers usually prefer to ask the status of the project for which they have done the investment. Therefore, the companies must be prepared to answer these queries related to position of the project by taking support of the customer care services. Lot of calls related to queries on a new project is received whenever a real estate company launches a new project or put a property on sale. To handle these calls, the company requires proficient agents who can provide detailed information using their communication skills. The real estate agencies need to remind the customers about submission of documents and due payment for smooth property transfer process. This is where the customer support agents come in handy for the firms. Blend of customer support process and telemarketing service is the ideal combination for this big industry. Therefore, the real estate companies can upgrade to an upper level by using the support of call center agencies.